First of - if you don't fancy steak this is obviously not for you (still, it may be a good read). I used to consume steak on a considerably regular basis and XO Steak House in Kota Kinabalu was my favourite dine in food outlet. It's a 'was' as the restaurant is no longer in operation. Knowing that I'm a steak lover, my wife treated me to some fabulous dinner there. The following is an excerpt from my daily reading of the Daily Express and you'll find it interesting if you love steak like I do. So, which is better for you? That depends on who you are. If you are hungry, cooking is invaluable because you need all the fat and calories you can get. Cooking reduces the chewing time and begins the digestive process almost immediately. Some scientists even argue that the invention of cooking drove the evolution of the human brain. Do a little googling and you will understand what I mean. On the other hand, if you are an over-fed modern person you don't need more calories or more fat. You need the iron, vitamins and possibly the protein in the meat, in which case less cooking maybe better. Above all, if you already eat lots of meat then more is generally going to be bad for you. If you eat little meat then a steak can be good source of nutrition whether well-done or rare. For me - I like it well-done but I'll take it sparingly now as eating less meat is greener and it is better for my overall health, and yours. I take more fish now, soup or grilled. I like Vegetarian, say if possible once a week. Look delicious but I prefer well done or medium rare hehehe..
Aaah! 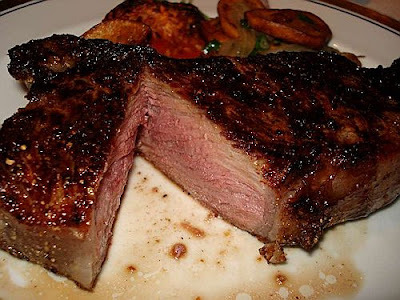 I love steak, seasoned and rare, but alas, seldom have it anymore. Mouthwatering photograph! Thanks everyone for reading commenting. I was trying to put this in the context of looking at how and when the doneness of steak grilling benefits you and me, the consumers. Very brief post but hoped it triggered your urge to dig deeper for info. I would like it well-done and with some wine too.